There are between 10 and 12 scholarships available for UK and EU students (see How to Apply for details). Industry sponsored Scholarships are also available, see details. In a half-day workshop members of the 2017, 2016 and 2015 cohorts of the Centre for Doctoral Training in High Performance Embedded and Distributed Systems (HiPEDS) discussed questions and issues around societal and ethical implications of research in engineering disciplines. 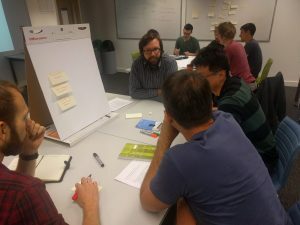 The group of PhD students reflected on their own research areas and explored potential risks that may occur as a consequence of their research outputs. They also discussed what responsibilities each individual researcher might need to consider. The goal of the workshop was to develop a HiPEDS Code of Conduct that summarises these thoughts, and to develop a structure and format for future CDT workshops on this topic, addressing these issues in a way that is relevant to HiPEDS students.